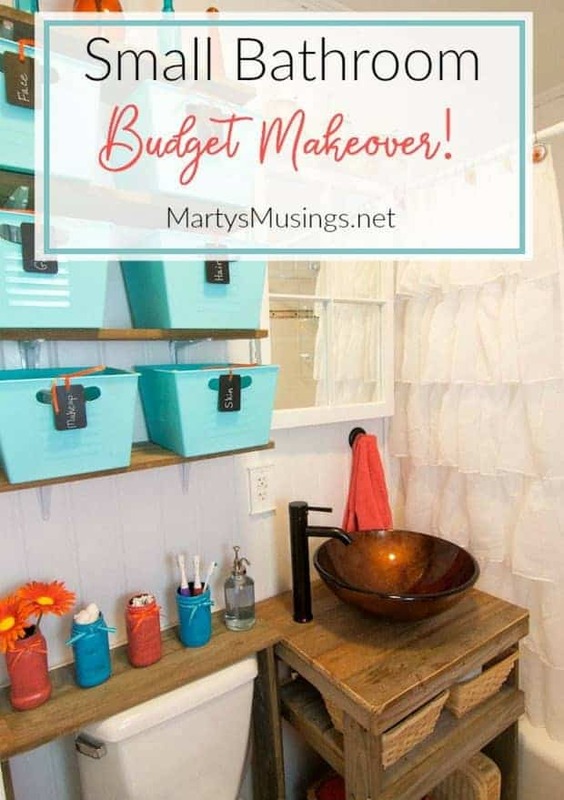 This small bathroom remodel combines frugal tips on storage with DIY repurposing projects while creating a rustic, one of a kind space. If you follow me on Instagram or facebook you know we’ve been in the middle of a bathroom demolition for several weeks. We live in a 2000 square foot house that was built in the 1950’s. Need I say more? And my favorite part? When you sat on said toilet the door opened into your legs, which was always fun when the kids were smaller. We have not touched anything structurally in this room for the 22 years we’ve lived here. 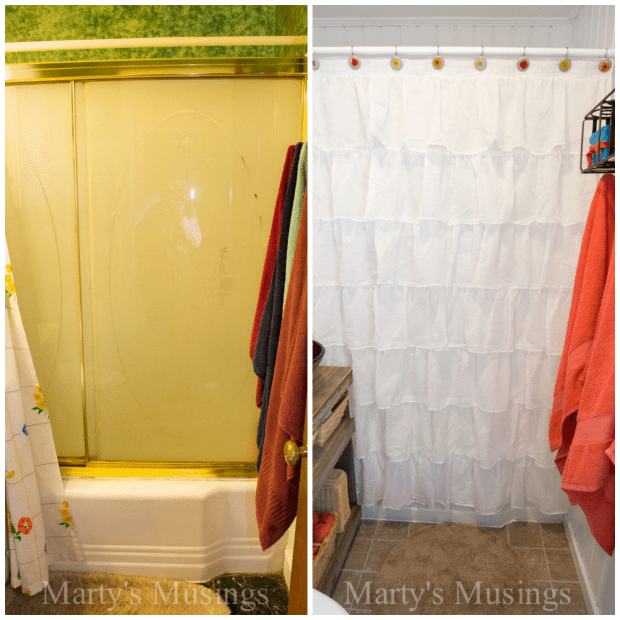 Say goodbye to green floor tiles, sponge painted walls and ugly wall tile. 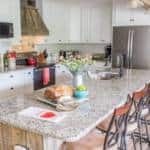 Welcome white bead board, fence board cabinet and shelves, new fixtures and thrfited accessories with aqua and coral accents. 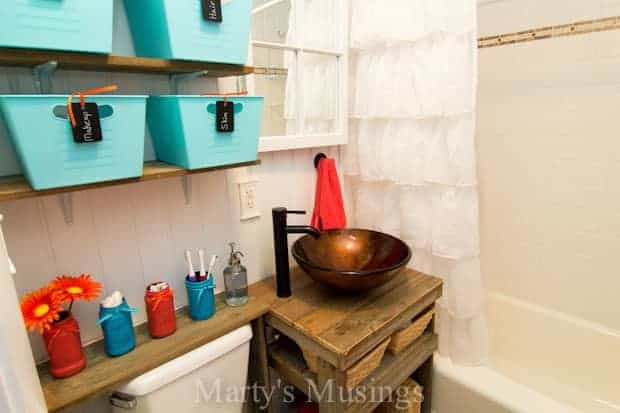 The whole reason for the small bathroom remodel? 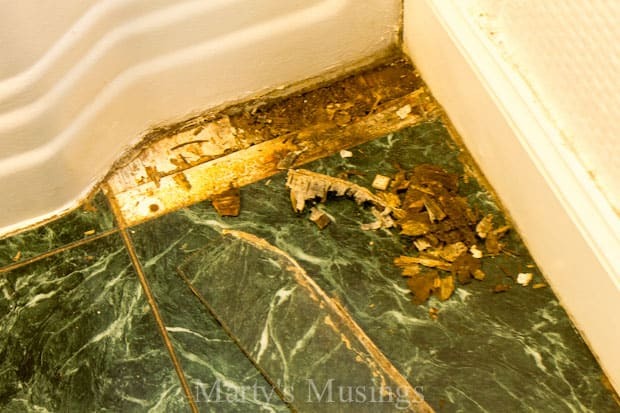 A leak behind the shower kit that was rotting the baseboard. Even though the rotted area wasn’t as large as we feared, we knew it was an opportunity to tackle another DIY project from the ground up. The only things that remained were the toilet and tub. Everything else? Gone! The most important thing we did was enlarge the room and discover a source of surprising space. 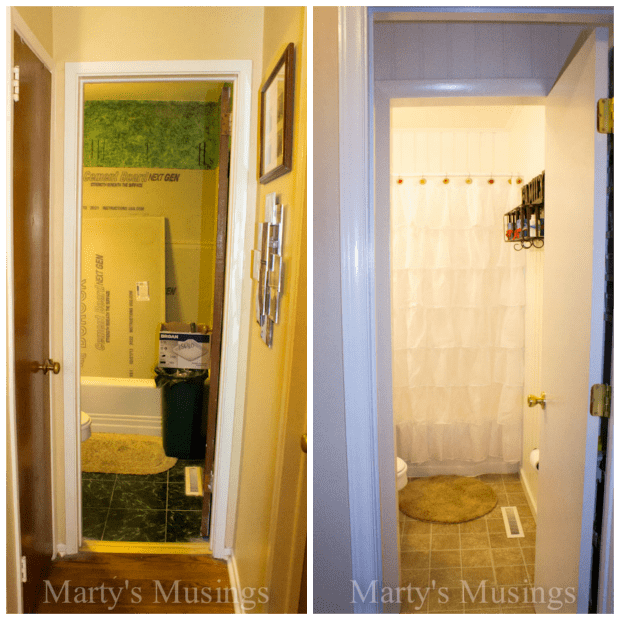 We removed the original door and Tim bought and installed a frame and casing and moved the door 3 feet farther out. This one move was the topic of many heated lively discussions. 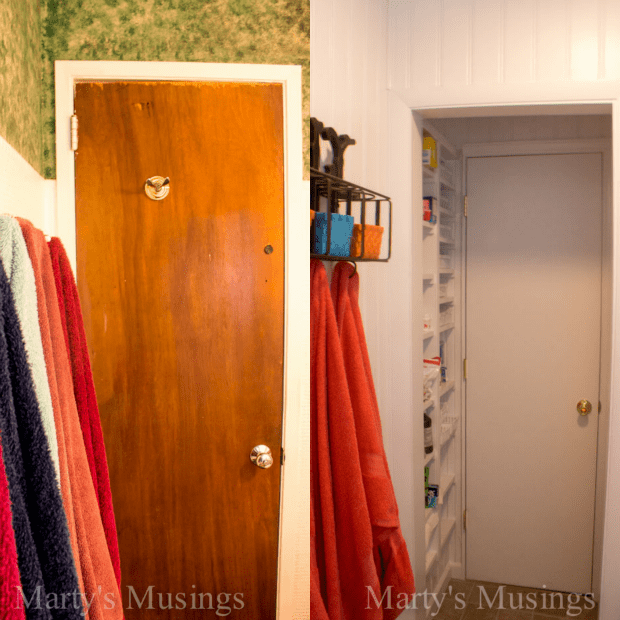 As you’re looking into the bathroom you can see that the door on the left is gone (now replaced with an accordion door) as is the original bathroom door. Removing the shower doors, shower kit, sheetrock and wall tile, as well as painting the bathtub were an essential part of the game plan. Total fun? 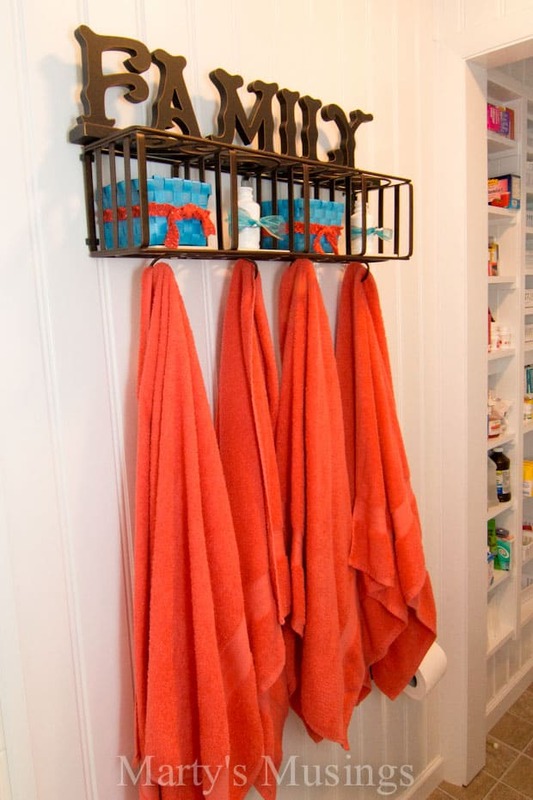 A frilly shower curtain with new coral towels. 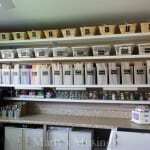 Tim has written a great tutorial on how he tiled the shower himself (parts one and two) with Bondera tile mat adhesive. The end product? Beautiful and totally professional looking. 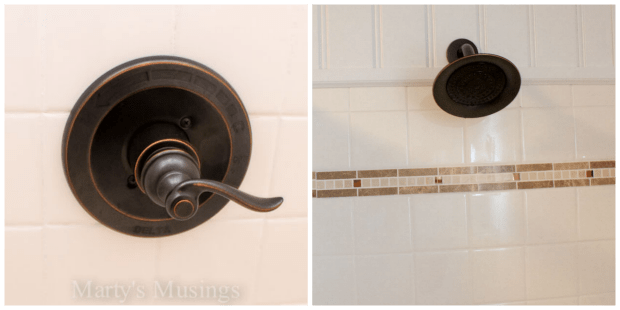 The shower fixtures were an oil rubbed bronze finish that stands out against the tile so well, and I love the new style! 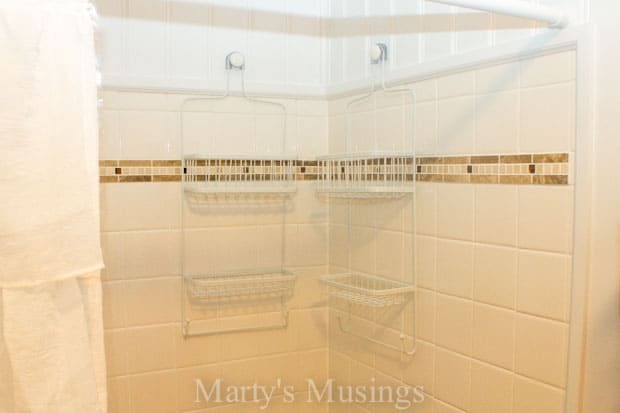 These metal shower organizers were the perfect touch to corral all our toiletries. One of my most favorite parts? 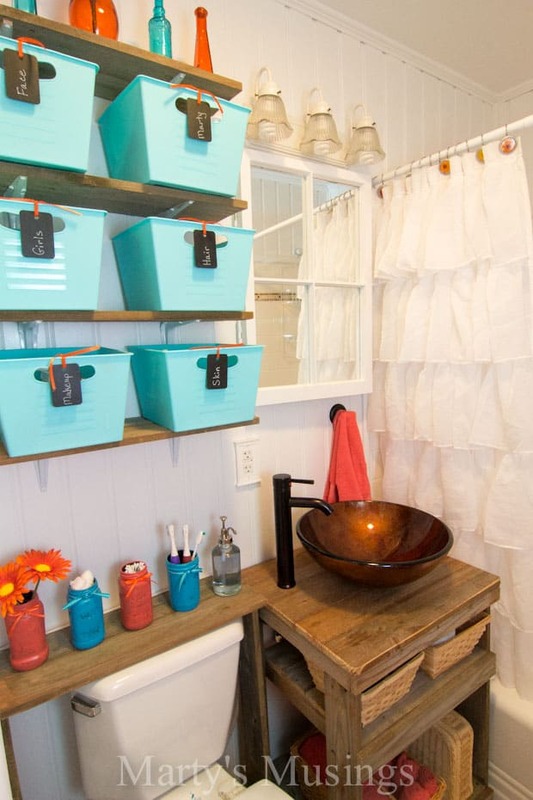 The new russet glass vessel sink, farmhouse style faucet and fence board cabinet Tim built. 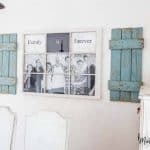 Can you tell we have a thing for repurposed fence board projects? Did you spy anything unique above the sink earlier? Check out this old window mirror. Yep, we like window projects, too. 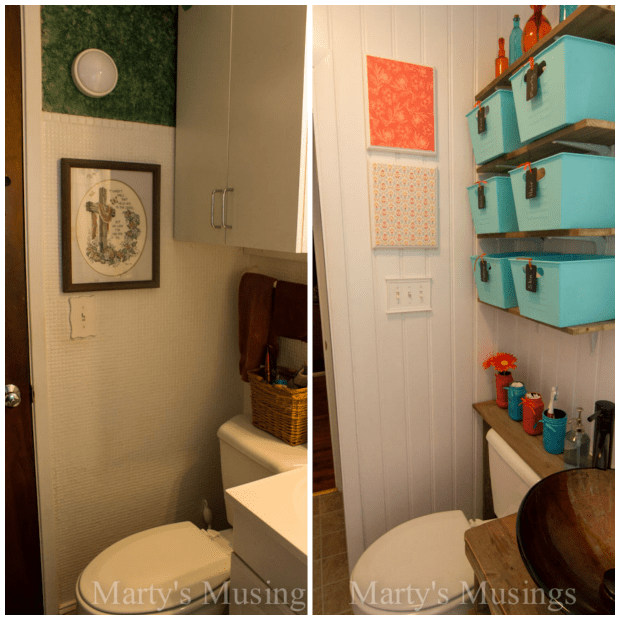 In this picture you can see Tim removed the cabinet above the toilet, built fence board shelves and an over the toilet tank stand for organization. 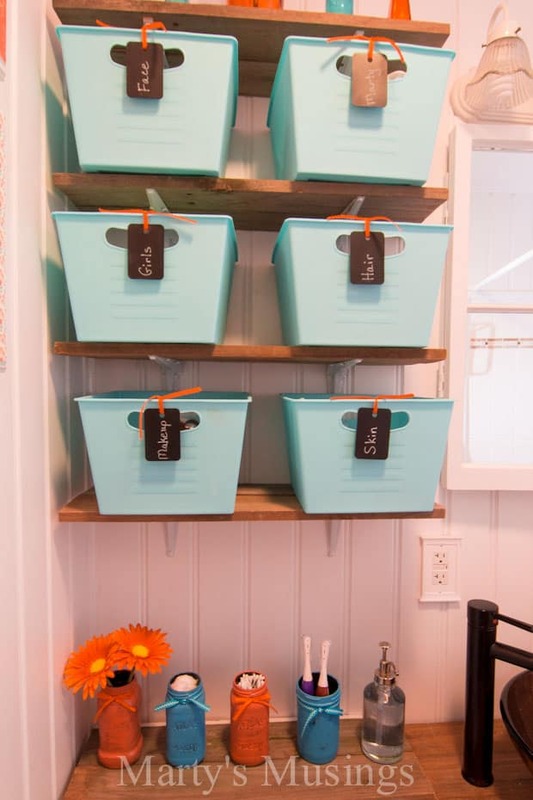 Then I got busy decorating with dollar store baskets and repurposed items. Did you recognize that this shelf is a cd rack turned on its side? $2 yard sale steal and I love it! 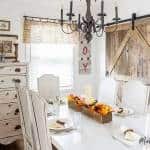 Total price of the remodel? Right at $2000. 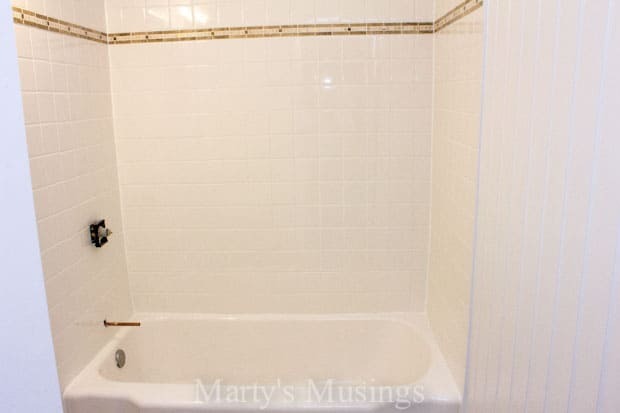 The biggest chunk of this ($750) was the plumbing labor to replace the internal lines and valves behind the wall and change the shower fittings. We worked on this everyday for about 6 weeks while Tim had a slow spell in his painting business. 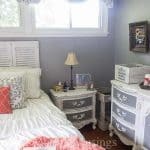 My hubby and I will be writing about this remodel for quite a while! 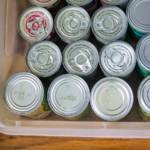 There are so many DIY projects and fun things to tell you about. 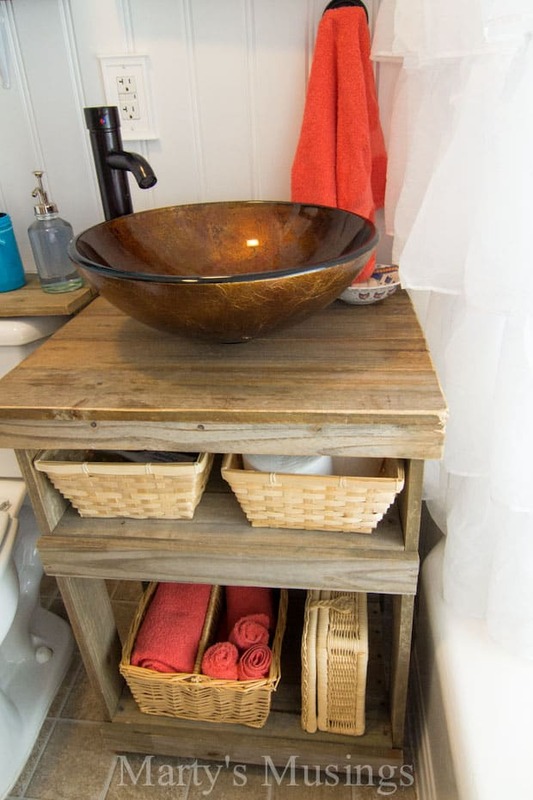 We are confident that if we should need to sell the house in the future there’s a much better market now with one very functional (although tiny) and beautiful little bathroom! Hi, you both did a fabulous job. Love the lights above the sink, could you tell me where you got them from? Thanks so much. Hi, Michele. I have no idea whether it was Lowe’s or Home Depot but it was one of the two. Good luck! 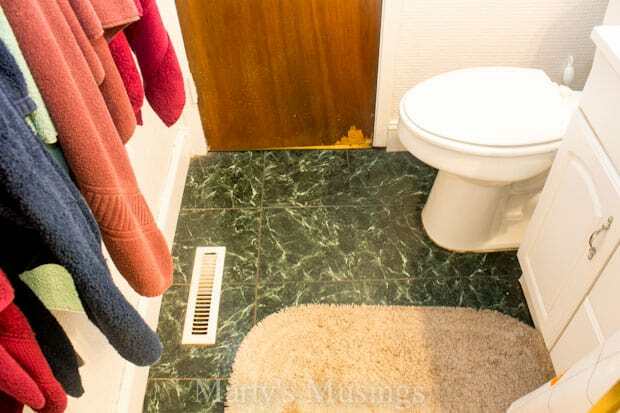 The rotting baseboard is a good reason to overhaul the bathroom. I wonder if we could move our bathroom door out a bit as well. 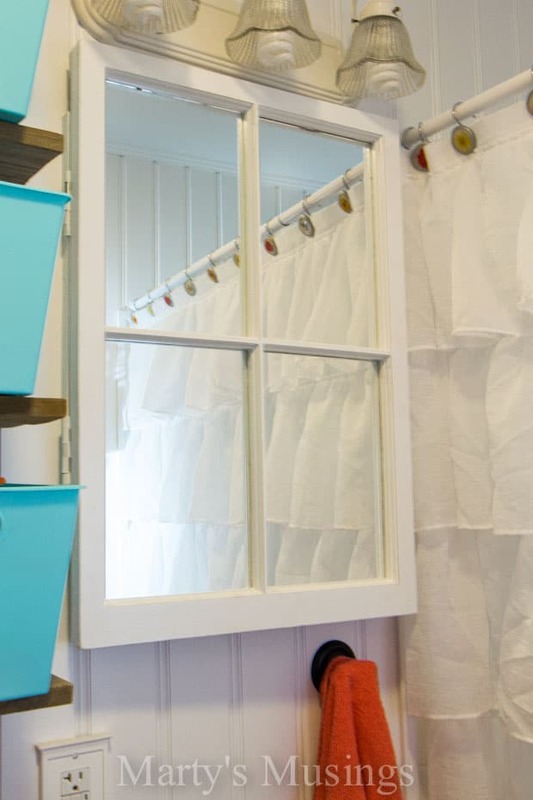 Having some built in shelves and more elbow space would be so nice. We’ll have to check out the layout here and talk it over.